Everyday we encounter people and situations that challenge our ability to demonstrate the love of God. And whether we realize it or not, there are also plenty of opportunities for us to offend one another. However, learning to operate in the God-Kind of Love insulates you from the offences, hatred, and tactics of the enemy that try to hinder your growth in God, and ultimately stop your faith from manifesting God’s promises in your life. 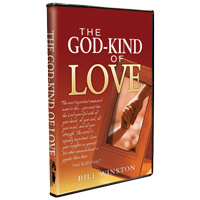 In this timely and challenging teaching series, Pastor Bill Winston helps you understand how to walk in the God-Kind of love. God is Love! And if you practice walking in the God-Kind of love, you will discover that God will always manifest Himself in your life. Begin demonstrating the nature of God to a lost and hurting world by learning how to walk in the God-Kind of Love!